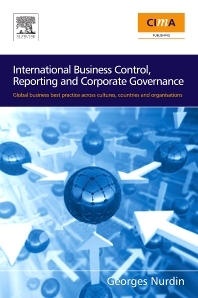 This book is designed to help Business Controllers / Accountants / Finance Directors / Bankers / Financial Analysts / Business Consultants to understand that International Business Control is much more than just a business being IFRS and US GAAP compliant, or just an extension of the domestic HQ control system. Financial and Business Control Managers, coming from a technical/professional background (e.g. Accountants, Finance Directors) who are faced with a business situation where they will have to deal both globally and across cultures. This is the case for executives, managers and professionals who are promoted from a domestic role to an international position, (e.g. HQ global role, or expatriation) or who have to control/operate complex joint ventures combining culturally diverse organisations, or who are involved in off-shoring operations/global sourcing. The book is also for managers, accountants and bankers involved in trans-national Mergers & Acquisition. Georges Nurdin, MSc., MBA, Ph.D, FinstD, studied international business, management and economics in Oxford (UK), Paris (France), Berlin (Germany) and in the USA. For over 20 years he held global divisional CFO, CEO and Director positions in leading American and European multinational corporations, including GE, Du Pont de Nemours, L&G-Siemens and Valéo. His extensive international experience spans Europe, Russia, the Middle East, Africa, the Americas and Asia. For the last ten years Dr Nurdin has advised private and public sector boards and international organisations on international business, economics, trade and cross cultural management. publications and regularly delivers lectures and conferences in leading world business schools.